Cross platform: runs on all OS with Java SE support (Windows, Linux, MAC, others). It can be used directly from any JVM language such as Java, Kotlin, Closure, Scala, Groowy, JRuby or Jython. Compatible with all SIP server, softswitch or IP-PBX such as Asterisk, Freeswitch, FreePBX, Cisco and others. The settings can be specified from: API, command line, config file, URL or sent via SIP signaling. 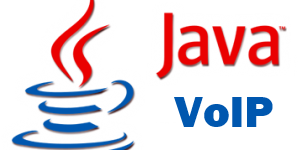 With this Java VoIP SDK you have a full featured SIP/media stack in a single jar file, easy to integrate or embed into your desktop or web java application. Create your custom java voip client, integrate it with callcenter software or embed in VoIP devices such as IP-PBX or gateways so users will have a fully functional VoIP softphone without the need to download any other third-party software. You can create your own custom java softphone or use it to add VoIP call capabilities into any software not directly related to VoIP (such as games or CRM’s) or to perform any kind of VoIP automation (auto dialer, auto answer machine, etc). //You can also register, accept incoming calls, send chat message and perform other operations. //Download a working example from here: Java SDK Test. //See the documentation for more details. All prices are in USD. You can find the other payment options here. Delivery time: one workday.